It’s our new thing. Staying up late to feel the warmth from the fire as the night air cools down, then waking up early to come right back outside to the chilly morning to eat breakfast before starting our busy days. 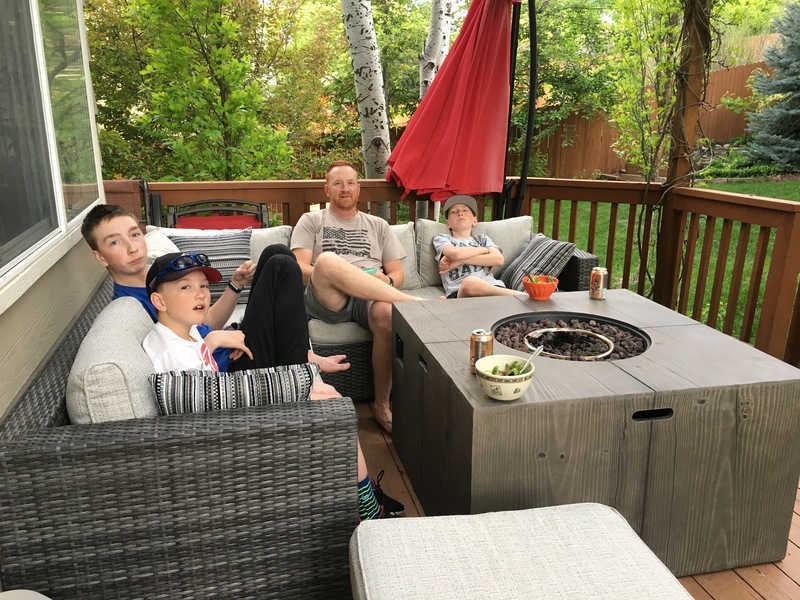 We have a new fire pit that is big enough to eat around and a comfy outdoor couch that we never seem to leave. Eat Well – Laugh Often – Live Outside, has become our family motto. I have a recipe that I’ve been meaning to share with you for awhile that has become a family favorite. 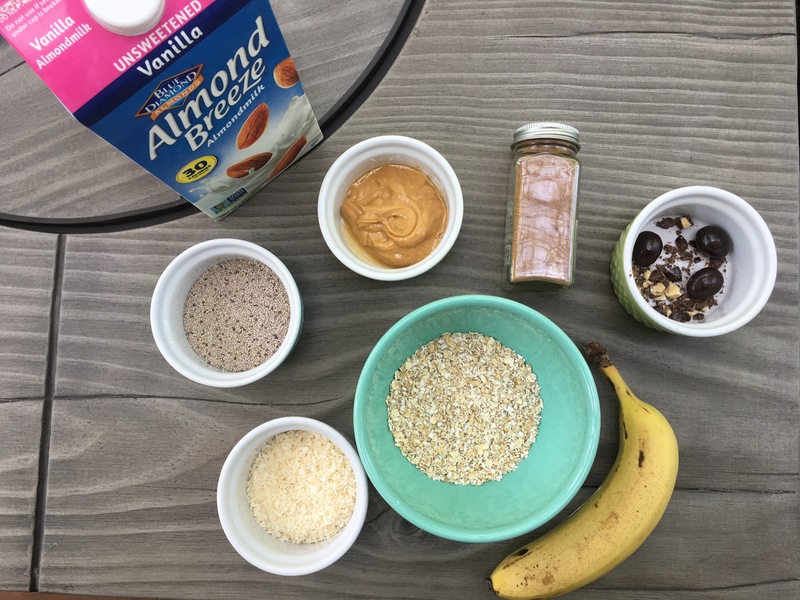 It’s probably more of a ‘concoction’ than a recipe, but I know you will enjoy this quick and healthy meal that I have partnered with Blue Diamond Almond Breeze to bring you. 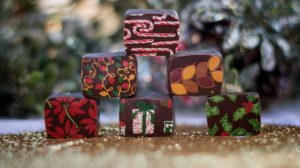 It’s one I make often, with endless possibilities, that each family member can customize, even the picky kids. 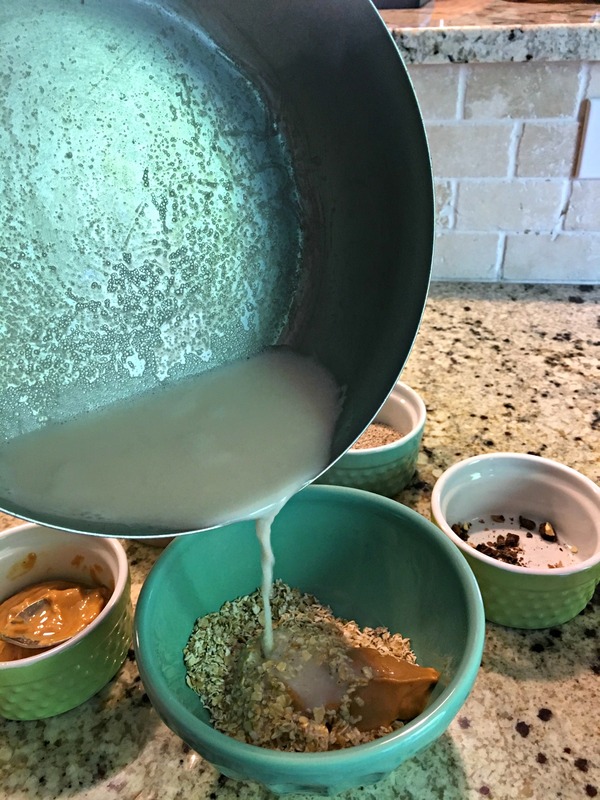 I use quick cooking oats, hot almond milk, and whatever topping I have in the house that week, though I do have my standard ‘go-to’ bowl I’ll share in the recipe below. 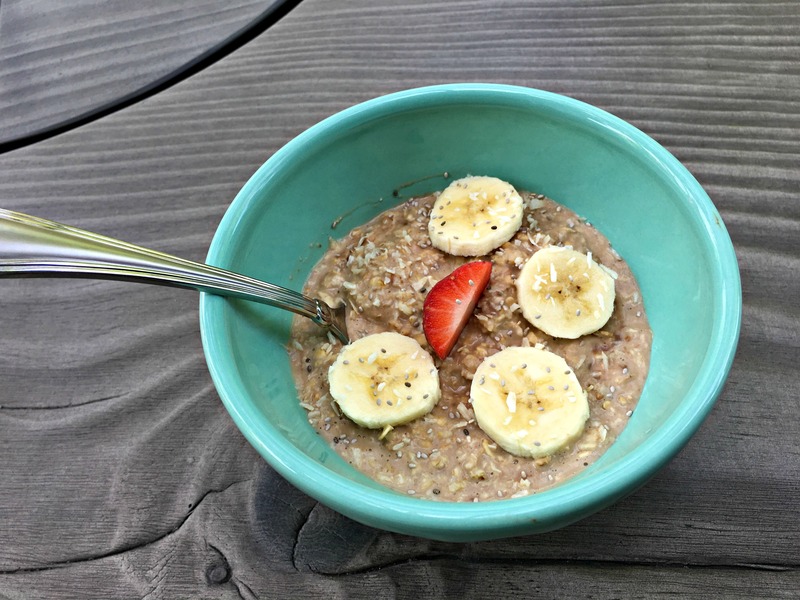 1/3 heaping cup of quick cooking oats (gluten free or regular). 2/3c Blue Diamond Almond Breeze Unsweetened Vanilla Almondmilk, may not use all. Dark chocolate almonds (or chips/chunks of dark chocolate), just 2-3 chopped. 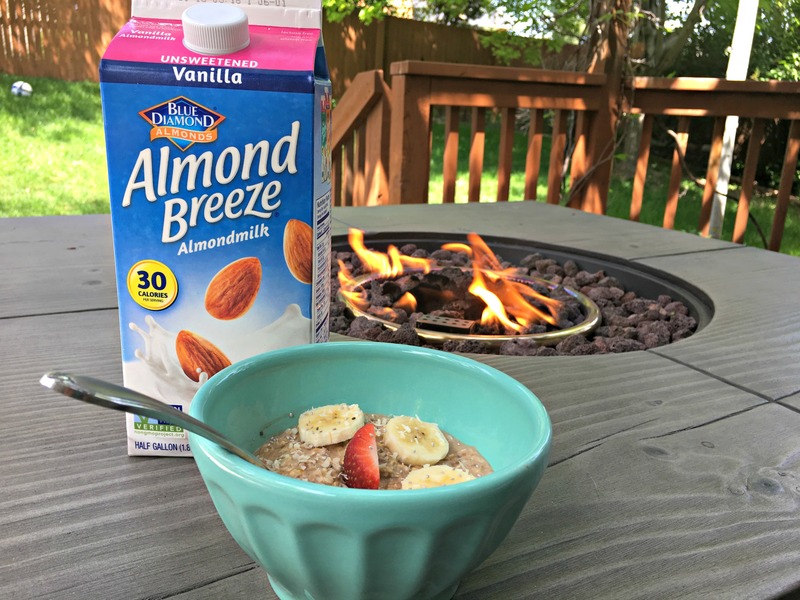 On the stove (or microwave) heat the Almond Breeze Almondmilk. While that is getting hot put your oats, nut butter, and chocolate in a bowl. When the almond milk is thoroughly heated, about to boil, pour into your bowl until oats are just covered or as soupy as you like. Let it sit for a minute or two while the oats cook, the nut butter gets oohy gooey, and the chocolate melts. Stir it up. Sprinkle on some chia seeds and cinnamon. Raisins or other dried fruits. Flax, Sunflower or Pumpkin seeds. Drop of Honey, maple syrup, agave nectar if you need more sweetness. We are avid fans of Almond Breeze Almondmilk and it is always stocked in our fridge. I use it for everything that calls for milk, including drinking it straight up a glass. We love the taste! Almond milk is an excellent source of calcium (50% more than skim milk! ), Vitamin A, Vitamin D, Vitamin E and has far fewer calories dairy milk. A cup of Almond Breeze Almondmilk contains 30 calories, compared with 83 calories for a cup of skim milk. It’s a great option for those that are lactose-intolerant or just want to consume lower sugar foods. Mornings just can’t get any better. Celebrate Dairy Month with an alternative! 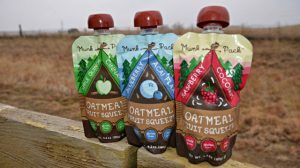 How would your family mix up your Quick Oatmeal Bowls?